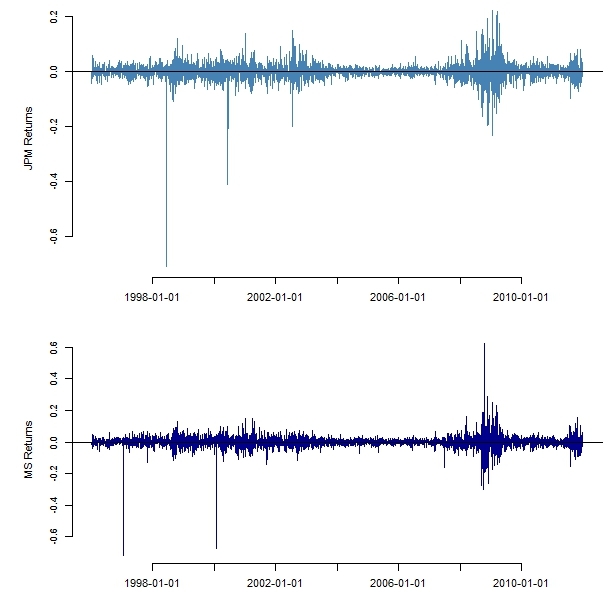 While linear correlation represents the appropriate measure of dependence for normally distributed asset returns, capturing co-movements between non-normal financial asset returns requires the theory of copulas, a flexible way for modelling general multivariate dependencies. 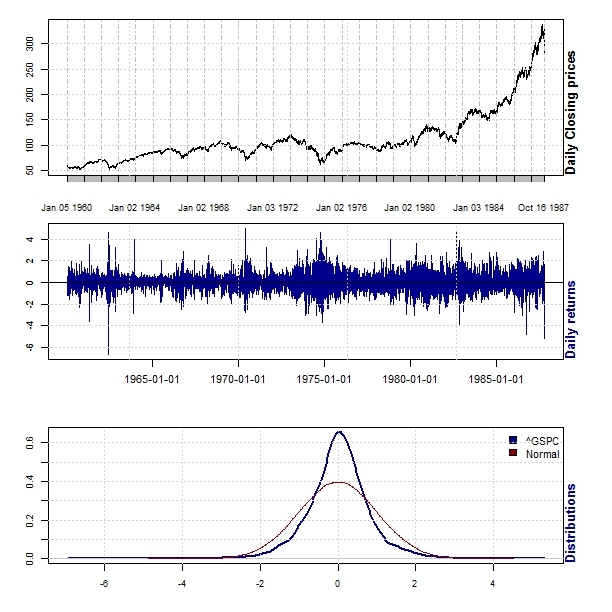 Let’s download 5 years worth of price data for JPM and MS, set up the data environment, calculate log returns and explore the marginal distribution of returns. Visual inspection of the above figures should convince us that neither JPM nor MS returns are normally distributed, invalidating the use of linear correlation as a reliable measure of dependency between these financial assets. 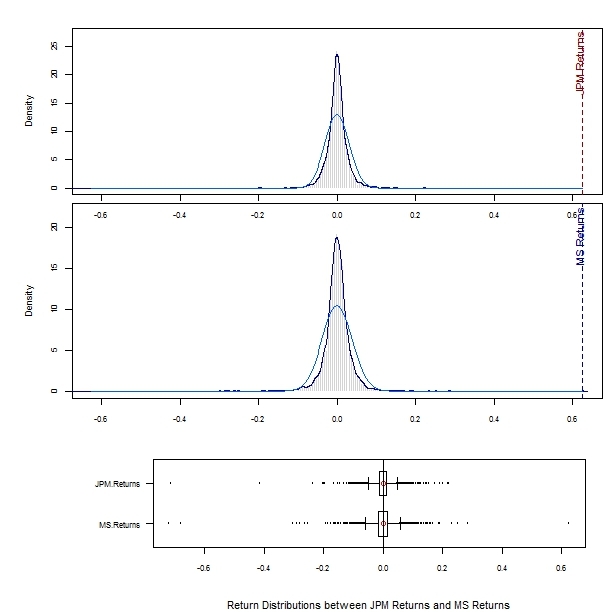 In addition to the univariate marginal distribution explored above, let’s look at the joint bivariate distribution of MS and JPM log-returns and compare it to simulated bi-variate normal data. 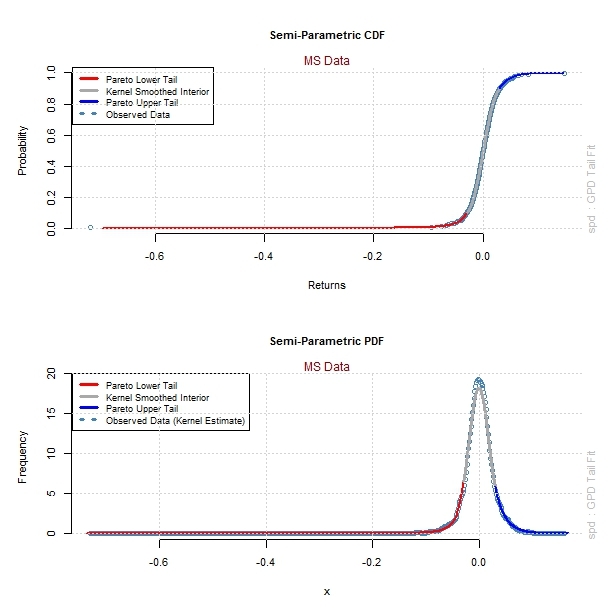 Visual inspection of the graphs suggest that the simulated bi-variate normal data matches the joint behaviour of returns in the middle of the distribution quite well but does not capture the observed dependence in the tails. 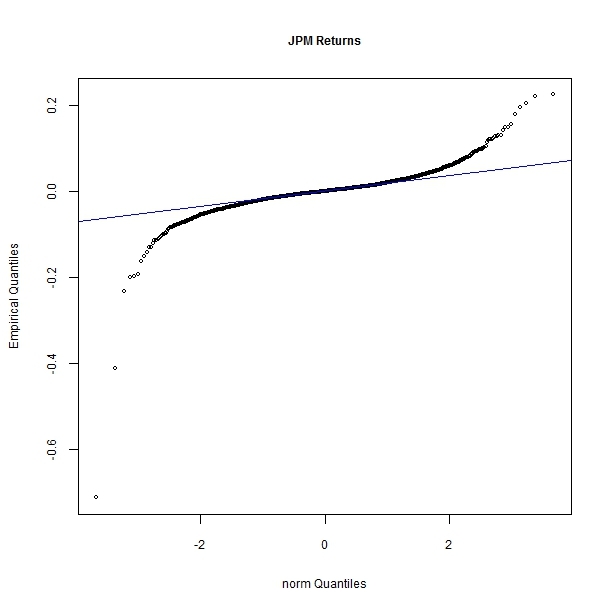 When the bi-variate normal distribution does not adequately describe joint returns,pearson correlation may not be a proper measure of dependence. 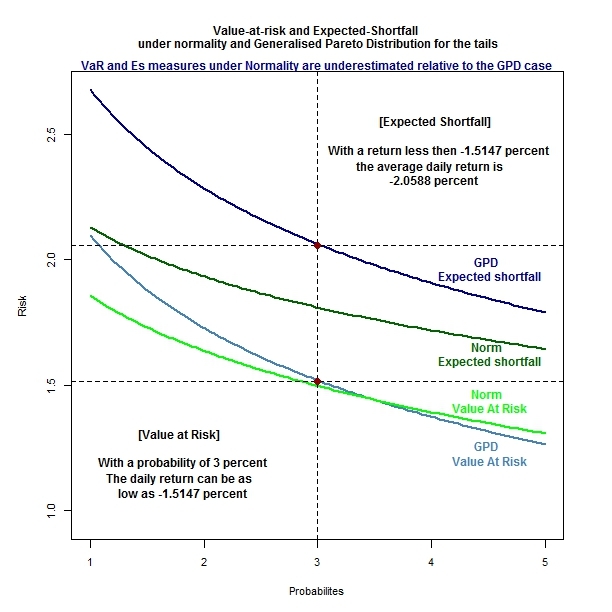 Tails of asset returns can be modelled using the generalised pareto distribution(parametric) while the centre of distribution can be captured using an Empirical distribution function (non parametric). This results in a semi-parametric approach to modelling the bi-variate data. 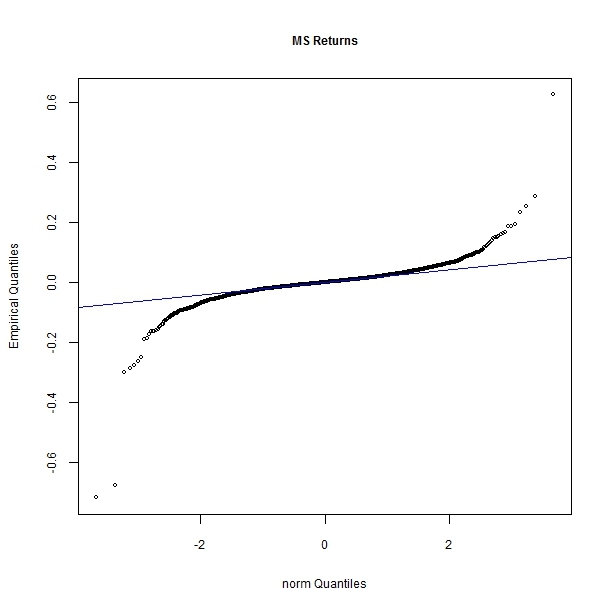 Incidentally, if we had imposed a normality assumption on the JPM and MS data, data points would be clustered around 0 in the expected way (last 3 graphs). 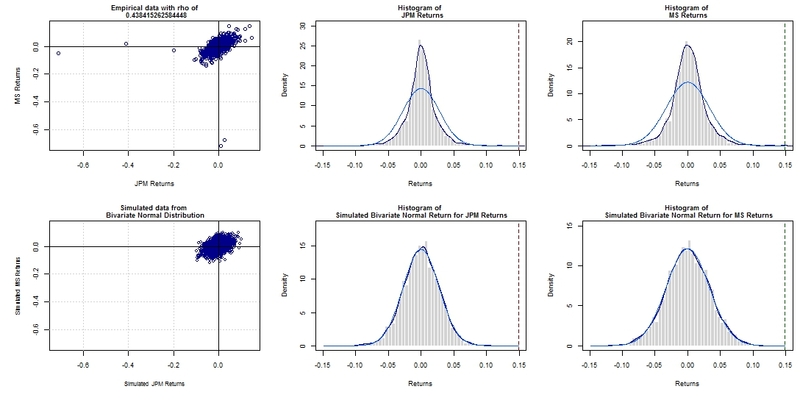 Let’s fit a semi parametric model to the data and compare the actual returns with simulated normal, and semi parametric returns. The semi parametric model is a better fit than the normal model. Extreme value theory is a branch of statistics dealing with the extreme deviations from the median of probability distributions. It seeks to assess, from a given ordered sample of a given random variable, the probability of events that are more extreme than any observed prior. Extreme value analysis is widely used in many disciplines, ranging from structural engineering, finance, earth sciences, traffic prediction, geological engineering, etc. EVT is a tool which attempts to provide us with the best possible estimate of the tail area of the distribution. However, even in the absence of useful historical data, EVT provides guidance on the kind of distribution we should select so that extreme risks can be handled prudently. There are two broad methods of modelling extreme values. 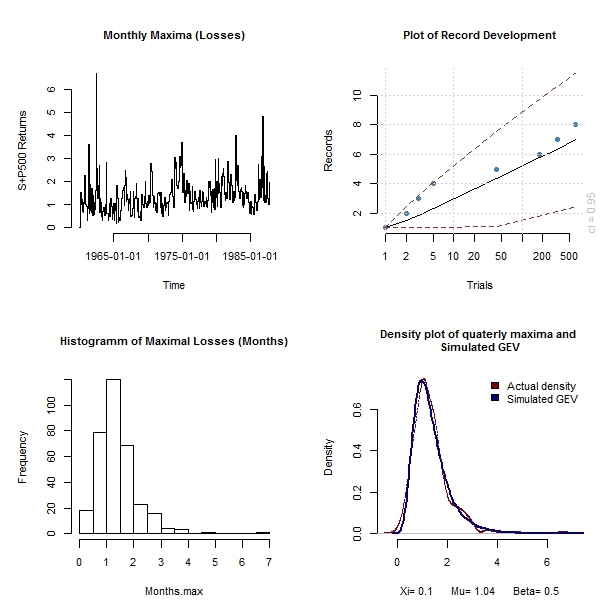 The oldest group of models are the block maxima models; these are models for the largest observations collected from large samples of identically distributed observations. A more modern group of models are the peaks-over-threshold (POT) models; these are models for all large observations which exceed a high threshold. The POT models are generally considered to be the most useful for practical purposes. 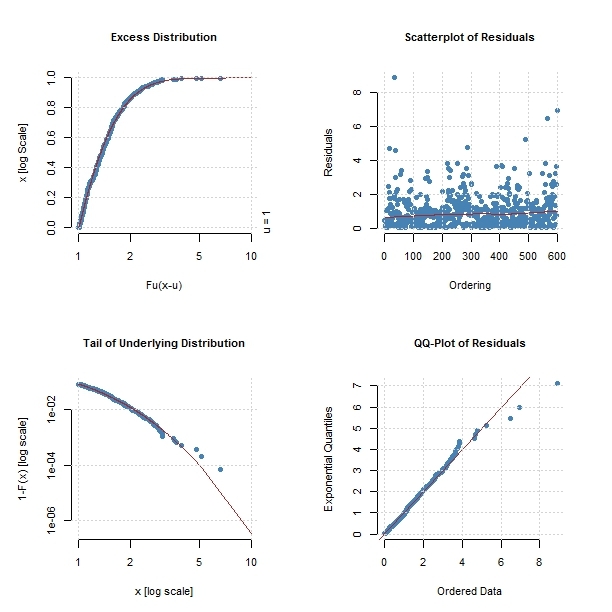 Distribution: Generalised Extreme Value Distribution (GEV) that encompasses the Gumbel,Frechet and Weibull distributions ( corresponding to ξ = 0, ξ > 0 and ξ < 0 respectively). Implementation: Data are segmented into blocks of equal length and a series of block maxima/minima are generated to which the GEV is fitted. Probability plot: the fitted value of the c.d.f. is plotted against the empirical value of the c.d.f. for each data point. 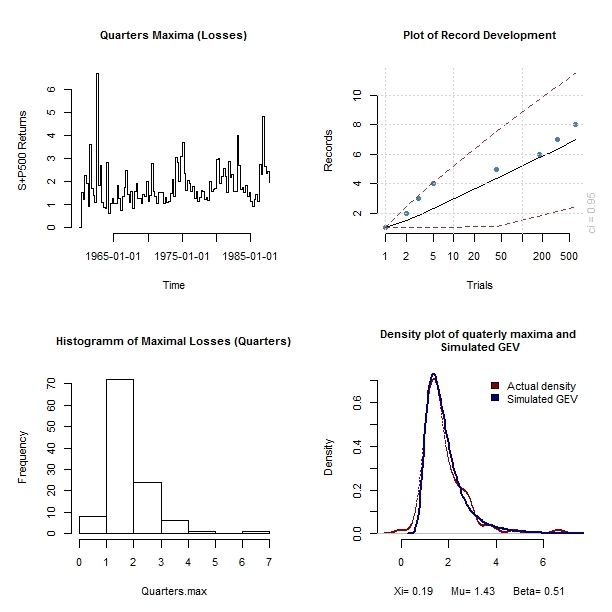 Quantile plot: the empirical quantile is plotted against the fitted quantile for each data point. 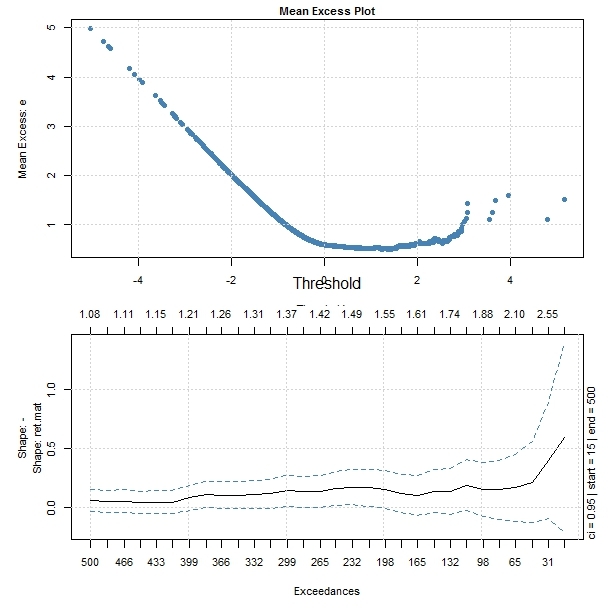 Return level plot: the return level (with error bars) is plotted against the return period. 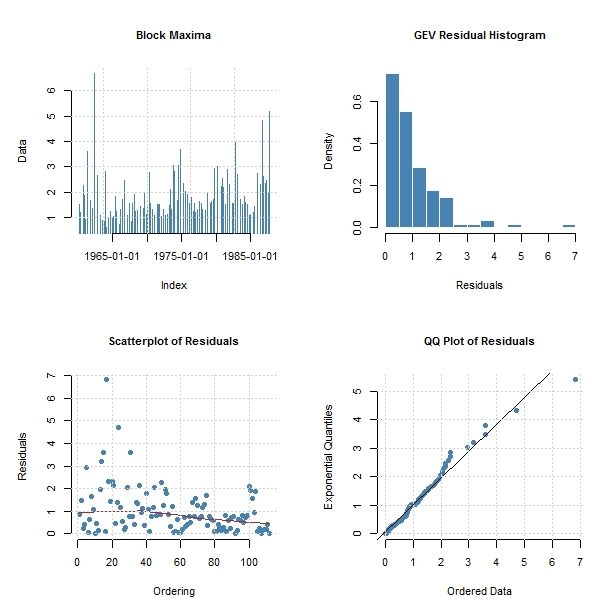 Density plot: the fitted p.d.f. 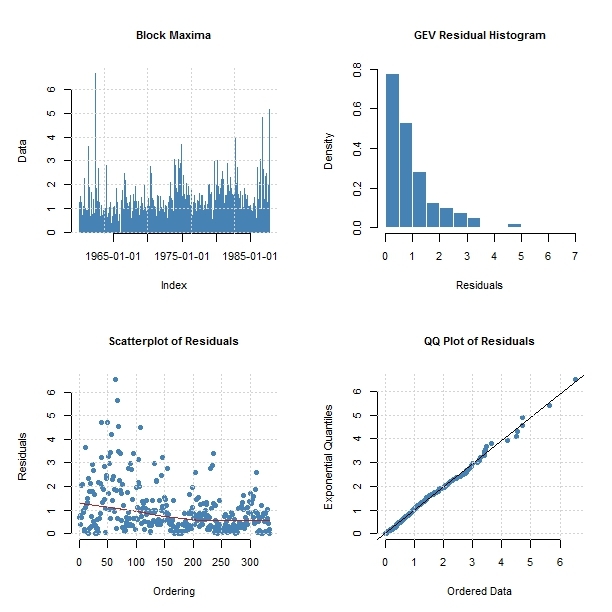 is supereimposed on a histogram of the data. Fit the GPD to the observed excesses x − u0. 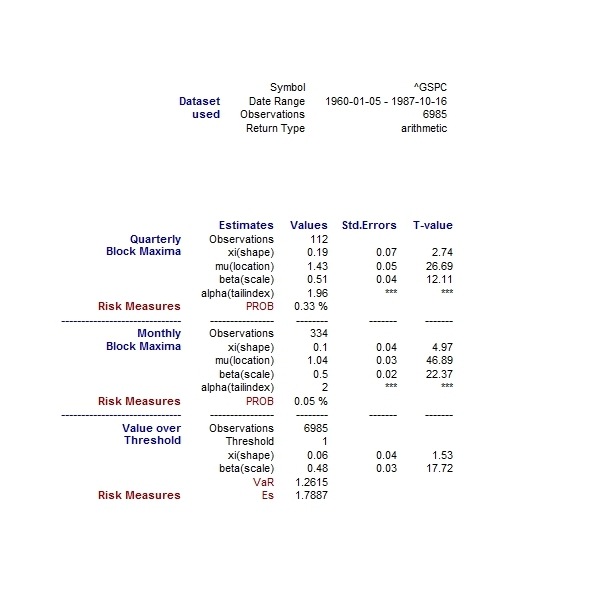 Use the fitted GPD, together with some model for the rate of exceedances X > u0, to provide estimates for return levels. 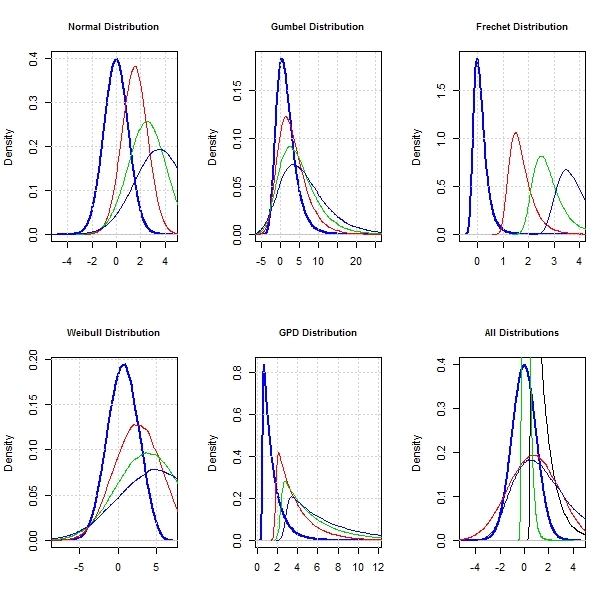 Let’s simulate from the normal ,GEV and GPD distributions and visualise the differences.